A new kind of camping has been sweeping America for decades and becomes more and more popular each year-RVing (Recreational Vehicle-ing). We do not find an unpaved road these days easily, and when we do it is usually covered in gravel, and in many cases located in a campground. Camping has become one of the fastest growing pastimes in our country today. But for many, camping does not include pitching a tent, fishing for dinner or otherwise roughing it. A new kind of camping has been sweeping America for decades and becomes more and more popular each year. It is referred to as RVing (Recreational Vehicle-ing). Often fueled by married couples earning double incomes, these comfortable motor homes, exclusive travel trailers, convenient and compact cab-over campers, converted vans and pop-ups, and eloquent Fifth Wheels hit our nation's roadways by the thousands, every day of the year. Running water, furnaces and air-conditioning, microwaves, dual televisions, bathrooms, kitchens and queen-sized beds are only a few of the standards in an RV. These adventurous travelers enjoy their RVs on smooth surface roadways, encountering only an occasional pothole or other roadway obstacle. However, the Nation's first "campers"-the pioneers who migrated west by covered wagon train in the early to late 1800s-did not have today's luxuries and travel was not quite so easy. Aside from the rough journey of traveling by oxen-pulled wagon and walking great distances, travel was slow, and roads that were only rough dirt pathsto begin with often ended abruptly and detours were needed. Although pioneers did not have to pay the high cost of gasoline, they did have the challenge of keeping themselves and their livestock alive-particularly the oxen that pulled the wagons. Time was another important factor in wagon train journeys, as settlers tried to reach their destinations before winter. We enjoy a coast-to-coast drive within a few days, with our RVs temperature controlled. The covered wagon made 8 to 20 miles per day depending upon weather, roadway conditions and the health of the travelers. It could take up to six months or longer to reach their destination. Nowadays, we travel hundreds of miles in a day concerned only with reaching the campground before dark so that electric and water can be hooked up during daylight. Even though early toll bridges could be expensive, circumstances sometimes made them the best choice. 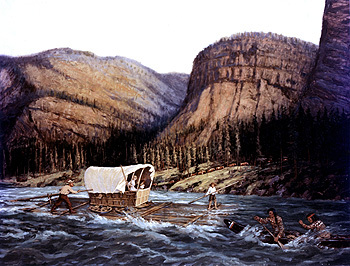 In Carl Rakeman's 1843-Oregon Trail, settlers navigate a river on a raft that's also carrying their wagon. 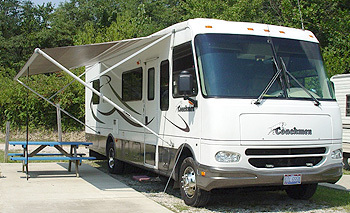 Armed with digital cameras and laptops to download photographs, RVers enjoy and capture the scenery of their travels. In reading many of the pioneer's memoirs and diaries it is apparent that along with all their hardships, they also had an appreciation of scenic terrain and good weather. A pioneer wrote in his diary in the early 1800s, ". . . Entered a beautiful valley. . .warm pleasant day. . ."
The pioneers' transportation problems were mostly caused by weather. Wet weather created mud and quicksand, and winds caused fallen trees and other calamities that slowed travel and the "race" to be settled before winter. Unfortunately, avoiding snow was not always possible. Hot weather could also become a problem as more frequent water sources were required for both traveler and livestock, though sufficient water and grasses were needed in all weather for the animals when the wagon train stopped for the night. Broken axles from ruts in the trails were a major problem, but many travelers brought along a spare, just as we are equipped with a spare tire. Without it, the wagon would be abandoned and other travelers would assist the family until the wagon train reached a town to purchase another. Toll bridges of today, sturdy steel and concrete structures with routine maintenance, may cost us a few dollars per vehicle; however, some early entrepreneurs charged from $5.00 to $15.00 to cross man-made wooden bridges over rivers. The charge would cover only the wagon and team, so other livestock that the travelers owned, such as cows and spare oxen, would have to swim, many drowning in the process. In April 2002, the Public Broadcasting Station showed Frontier House where three families lived the frontier life for five months. The DVDs of the program are available for sale or from your local library. The project, an educational mini-series filmed the families' daily lives and survival as 1883 settlers. Experience the bumpy covered wagon journey to their destination as we get a first hand look at how our ancestors traveled on primitive paths and roads, and often no roads at all.